Mountain Pleasure horses have been relatively unchanged for a century or more. They reflect the primitive Appalachian gaited horse type and may be ancestral to modern breeds developed in the region during the late 1800's and early 1900's, including American Saddlebred and Tennessee Walking Horses. As a landrace, the Mountain Pleasure is variable in type, with some horses having distinctively Spanish features and others resembling the larger, modern breeds. Consistent among all is a smooth four-beat gait that replaces the trot. They stand 14.2-15.2 hands at the withers and weigh 850-950 pounds. Most of the solid colors known in horses occur in the breed, including grays and roans. The limestone plateau west of the Appalachian Mountains of the United States has long been known as horse country. Horse breeding has been an important economic enterprise, and horses have been used for riding, agricultural work, and pulling a variety of vehicles. They had to be easy keepers, rugged, sure-footed, and willing. Kentucky was also important because of its central location, where Spanish horses from the Southeast and Southwest could easily be crossed with English and European horses from the East. 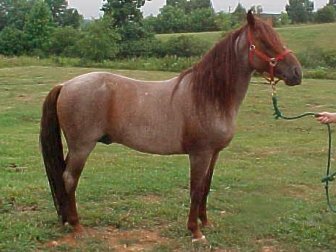 History suggests that Spanish horses likely contributed the "gaited" characteristic found in many of the breeds developed in this region. Gaited horses are those which naturally have gaits other than (or in addition to) the walk, trot, and canter of all horses; they may include the rack, single foot, and running walk. These gaits are more comfortable for the rider than the trot. Mountain Pleasure horses are prized for their calm temperament and are best suited to be a family pleasure horse rather than a high powered show animal. The most famous Mountain Pleasure horse, however, was Roy Rogers' original Trigger. Since Trigger did not trot, he was always filmed at a walk or a canter.